Barry Uden was surrounded by wood when he was growing up: the exotic wood that washed up after big storms in the English Channel, the barrels being repaired in the cooper's shop in the local brewery where he later worked, and the clinker-built boats he fished on as a boy. Each year the boats were scraped and treated with boiled linseed oil, and the smell still reminds him of his childhood. His earliest memories of woodworking as a child were of his grandfather's shop and all the wonderful old tools he used: "I loved them so much I now have a collection of antique woodworking tools and planes," he tells us. Barry apprenticed as a sheet metal and fabrication worker, but switched professions and became a self-taught cabinetmaker, building custom-designed kitchens. In between these jobs he ran a forklift at a brewery, worked as a postman, managed an apple orchard, built a 30ft charter boat which he ran in the English Channel, as well as running a landscaping company. Barry was also co-owner of the Hythe Forge where he made hand-forged gates. As a child, he watched horses being shod at the Forge, at a time when cars were only beginning to be seen in the neighbourhood. Barry's lifelong love of diversity carried over into his work. At the wood shop in his secondary school, no one was allowed to use the lathe, which naturally made him curious about what it could do. After building his own boat and renovating several houses, Barry thought he'd like to try woodturning. After moving from Kent to North Wales in 1988, Barry attended an introductory two-day course at the Old Stores Turnery in Nantwich: "I made a small bowl, and an egg and eggcup, and I was hooked! From that point forward, I was completely self-taught." Barry's first lathe was a Coronet No.3. 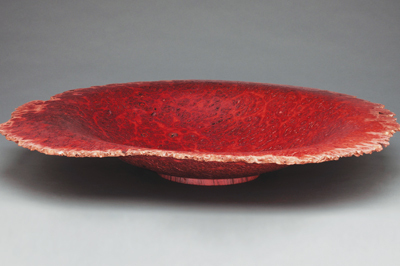 He had no chuck and turned mostly between centres, but longed to make a bowl. In those days, there were few woodturning videos and Barry had no one to ask for help. He learned by doing, and very quickly outgrew that first lathe, moving up next to a Wadkin RS, which enabled him to make much larger pieces. He ended up with a Harrison Graduate lathe, which he brought to America when he moved there with his wife in 2000. The Graduate was the lathe to have at that time, and although it doesn't have variable speed capacity, Barry still uses it on occasion today, alongside the VB36 and PowerMatic 3520B lathes he also owns. "My diverse body of work reflects my varied interests. I'm not happy doing the same thing every day, and I'm always trying new methods and tools,"he says; however, there is a common thread throughout Barry's work: "the classic form applied to pure woodturning. Although I occasionally add colour or texture to a piece as an accent, it never takes over the work. My main focus is doing justice to beautiful wood. I work with a lot of highly figured timber and burls, and I try not to obscure its beauty: the wood speaks for itself." The difficulty, Barry finds, is striking the appropriate balance: doing not too much and not too little: "I'm always conscious of my responsibility to bring out the best in the wood," he explains. Inspiration comes from many directions for Barry: nature, antique furniture and ceramics: "It's rare to see a poorly-shaped piece of glass or china," he comments. Barry believes that inspiration can come from anywhere: "I was even inspired once while sitting in a restaurant looking at the lights on the ceiling." Each piece of wood tells him what it's going to be, and accidents or flaws in the wood can dictate a change in design that can vastly improve upon the original plan for a piece. Like other professional turners, Barry is also a collector, and has pieces by some of the big names in woodturning. Some of his favourite pieces include works by Bert Marsh, Chris Pytlik, Jimmy Clewes, Dale Larson, Mike Mahoney, Jon Sauer, Mike Jackofsky and Richard Raffan. Barry has been influenced by many of the traditional turners, including Ray Key, Phil Irons, and the late Bert Marsh, who he cites as his greatest influence as far as form is concerned. In addition, there are many people in America that have influenced Barry: "I enjoy the work of Dale Larson and Chris Pytlik. I admire Mike Mahoney's ability to quickly and effortlessly produce beautiful shapes using only basic tools - he may be the best turner in the world," he says. Barry taught his wife to turn about six years ago, so it helps to have the three lathes previously mentioned, plus a Jet mini lathe which they use for small items and boxes. The Udens' workshop is a double garage beneath the house, so it stays somewhat cool during the hot Northern California summers. They also have an unfinished basement where they store their wood, which they either salvage themselves from local arbourists and process through their Timberking sawmill, or buy in quantity from importers. Barry's McNaughton coring tool is a key part of his equipment, and is one of only two tools that has saved him much more than it cost. The other is his Tormek wet stone grinder, which keeps a very sharp edge on the tools while removing a minimal amount of material. Barry's two favourite tools are the 10mm bowl gouge and the 13mm bowl gouge from D-Way Tools. He also uses a 6mm bowl gouge, which is extremely helpful when working in tight corners, or when trying to get a fine cut to remove tearout - as the bar stock it is made from is thinner, the edge it gets when sharpened is finer. "I'm always looking for new tools to make life easier: I recently purchased a 6ft captive boring bar to help with some of my deeper pieces, and am looking forward to trying it," he tells us. Barry feels it's important to be aware of and open to new tools, while at the same time remembering that no tool can overcome a lack of good tool control. He believes that learning to use a bowl gouge well is the basis for everything else - unless of course you only do spindle turning. As many turners would agree, life in the workshop week after week would be very difficult without some music, and Barry favours rock or blues: "Paul Carrack and the late Gary Moore have helped me make some wonderful pieces!" Barry strives to make everything as if it was going to be judged: â€œI never sell pieces that aren't up to competition standards - we keep them in our cabinet at home,â€ he explains. Although he doesn't enter a lot of competitions, it is a good standard to uphold to ensure the quality of the work. Barry tries to keep pieces for a while before selling them, to ensure there won't be any movement when someone takes them home. Regarding discipline, Barry motivates himself to go to the workshop every day by working towards particular deadlines. Doing the big art shows is a great motivator, as these mean he needs enough pieces to ensure the booth has as much beautiful work on the last day of the show as it did on the first. Barry tries to view woodturning as his job, and sets regular working hours - that way, he can produce consistently throughout the year. To get his work known, Barry submits his pieces to juried art shows, approaches galleries that will reach the audience he's looking for, and displays work on his website, which will soon feature a shopping cart. He also places ads in selected art magazines: "I have cards and brochures to hand out, and at the art shows, I have professional bags and labels for packaging my work. I often show my work at the AAW symposia - it's a great way to get exposure. 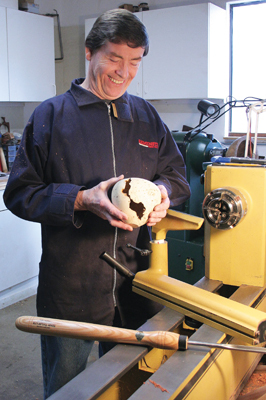 I'm also working on articles for some of the major woodturning magazines, such as this one." The promotional side is not the reason anybody starts turning, but Barry understands the need - as he puts it: "Self-promotion is one of the hardest things for artists to do, but is extremely important in woodturning." One of the important high points of Barry's career has been the reactions from the public at art shows. Another high was being invited by Phil Irons to include his work in Phil's new book The Wood Turning Bible. "I can't say there have been any real lows," Barry says, "Other than when I blow up a piece. It's hard to lose a really good piece, but as they say, if you're not breaking pieces on occasion, you're not pushing yourself enough!" One of Barry's hopes is to increase sales and broaden his exposure and add another art show to the set he and his wife attend each year. Barry is happy to do some demos, but wouldn't like to do as many as some professionals, as spending too much time on the road would reduce his focus on creating new work and significantly lower his output. Barry hopes to present at one of the symposia in the near future.